Yusa is a passionate, young singer from Cuba who is redefining the way in which audiences outside her country think about the nation’s music. Although there are traditional elements drifting through her third effort Haiku, for the most part, she has begun to chart an exciting musical course that is all her own. Yusa has been playing the guitar since she was very young, and she spent several years studying traditional music and jazz at Havana’s most respected conservatory. As a result, her work contains levels of diversity and depth that are not frequently encountered in outings by such fresh, new artists. Haiku — as its title suggests — is a playful and poetic journey through the singer’s personal, political, and spiritual concerns. At times, Yusa’s voice is reminiscent of Joan Armatrading at the peak of her interpretive powers. On several tracks, Yusa scats along with the dominant melody, mimicking the sounds of a guitar and a keyboard as well as an assortment of bird calls. On other selections — such as the glorious title tune — she sings in coltish phrases that demonstrate the incredible balance she has achieved between naturalness and discipline. Aside from Yusa’s expressive voice, there is a lot to enjoy on Haiku. The arrangements, the musical performances, and the tunes themselves are all singularly delightful. Sounds of cars in traffic, city voices, and the rhythms of the sea wind in and out of the songs, thereby creating a kind of organic travelogue through Yusa’s beloved Havana. When first listening to the album, I was struck by the warm piano, propulsive guitar, and overall acoustic ambience that Yusa and Brazilian producer Ale Siqueira managed to capture. Repeated strolls through Haiku reveal a rhythmic subtext that isn’t initially obvious. One can certainly hear aspects of Cuban traditional music in the grooves. Beneath the surface, however, organ, bass, and staccato whistling provide a subtly funky undercurrent that pushes the melodies along their paths. Throughout the endeavor, an ensemble of stellar musicians supports Yusa in a truly breathtaking fashion, and when Haiku’s all-too-brief, 40-minute playing time has run its course, it’s impossible not to want to begin the journey all over again. Yusa — like Cape Verdean guitarist Tcheka — is an up-and-coming musician who has arisen from ancient tradition yet also acknowledges the challenges of performing in a modern global society. Both artists respectfully modify their respective cultures’ musical paradigms to create songs that simultaneously sound traditional and contemporary. Along with Bebel Gilberto and Marisa Monte, Yusa is creating some of the most exciting and challenging material currently emanating from the Latin world. Haiku is vital, uplifting, free-spirited, and, most important, a lot of fun. It is destined to become a classic. 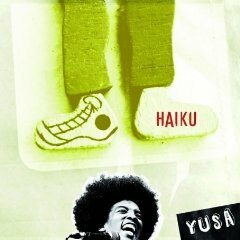 Haiku is available from Barnes & Noble.